Lexi Pitsas digs a ball. The freshman libero and the Wildcats will face off with Michigan and Michigan State this weekend. With Northwestern’s season winding down, the clock is ticking and the window for the NCAA Tournament is closing. The Wildcats (13-13, 3-11 Big Ten) will first stop in Ann Arbor to face off against Michigan (16-10, 6-8) on Friday night. NU will then head to East Lansing for a rematch against No. 8 Michigan State (17-6, 10-4) on Saturday. With six games left in the regular season and the NCAA Tournament looming over NU’s head, it’s crunch time. Coach Shane Davis said the Cats, sitting at .500, will need to win three of their final six games to qualify for the tournament. At this point in the season, Davis said the team’s hunger for wins is still very much there. After a successful nonconference season, NU has struggled in Big Ten play. Currently, the Cats are in the midst of a three-game losing streak and have lost eight of nine. Yet, this weekend promises to be an opportunity for NU to satisfy its hunger and snap its losing streak. For the first time this season, the Cats will take on the Wolverines, and while Davis identified a number of Michigan’s strengths, he also recognized several holes. In East Lansing, however, the Cats will face a familiar opponent — NU is fresh off a loss to the Spartans. During the match, the Cats showed improvement and an increased stamina as the game progressed with set scores at 25-13, 25-19, 25-18. Ultimately, though, it wasn’t enough. 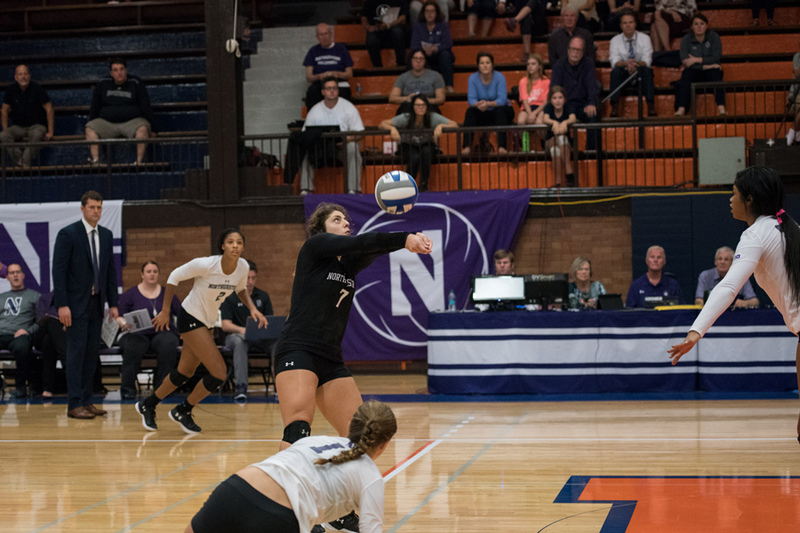 Freshman libero Lexi Pitsas said the short turnaround between last weekend’s game against Michigan State and the upcoming game allows NU to know exactly what to expect Saturday. Davis said the Cats need to look out for Michigan State’s size and the team’s experience. Seven of the Spartans’ 16 players are seniors, while NU only has three seniors on the roster. The Cats may have less experience, but freshman outside hitter Nia Robinson said their genuine love for each other could make the difference for the team this time around.